Agu is a young boy growing up in a West African country on the brink of civil war. As conflict creeps closer to home and panic rises in the community, Agu’s family strains to maintain a sense of normalcy. When the fighting finally reaches Agu’s village, his family is torn apart and he is forced to flee. Alone and vulnerable in the jungle, Agu crosses paths with a group of guerilla soldiers led by a fierce Commandant. Agu is indoctrinated into their ranks as the Commandant trains him to cope with his pain through violence. Agu soon learns how to use a gun and becomes accustomed to the duties of a full-time soldier. Commandant’s guidance provides order amidst the chaos, but his fatherly bond with his soldiers proves poisonous as the boys descend deeper into their anger and lose sight of their humanity. As the ragtag troops advance, Agu develops both a revulsion for and fascination with a war that slowly consumes him. Based on the eponymous novel by Uzodinma Iweala, Beasts of No Nation is an unforgettable, heart-wrenching tale of a young boy’s loss of innocence and the strength he must develop to persevere. Adapted for the screen and directed by Cary Fukunaga, Beasts of No Nation stars Idris Elba as Commandant, and introduces Abraham Attah as Agu. 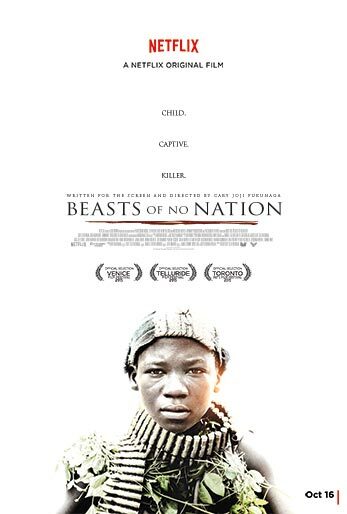 Beasts of No Nation was produced by Amy Kaufman, Daniela Taplin Lunderg, and Riva Marker and executive produced by Jeff Skoll, Jonathan King, Bill Benenson, Todd Courtney, Daniel Crown, Mark Holder, Tommee May, Peter Pastorelli and Elika Portnoy (credits not contractual).